Stir together chocolate and butter, in a large bowl, set over a large saucepan with an inch or two of simmering water. Stir until melted and smooth. Remove bowl from heat and whisk in egg yolks until combined. Cool chocolate to room temperature. In a large mixing bowl, using a mixer on high speed, beat egg whites and cream of tartar until stiff peaks form; beat in 1 tablespoon sugar until combined. In a large mixing bowl, using a mixer on high speed, beat cream, vanilla and remaining 2 tablespoons sugar until soft peaks form. 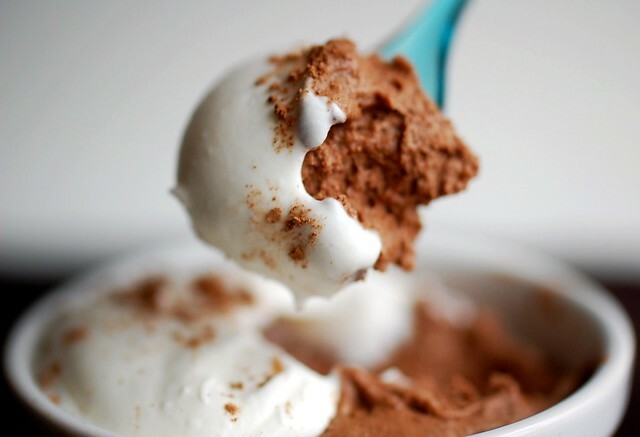 Fold egg whites into chocolate mixture, followed by whipped cream until combined. Divide mousse into 4 ramekins. Chill until ready to serve. 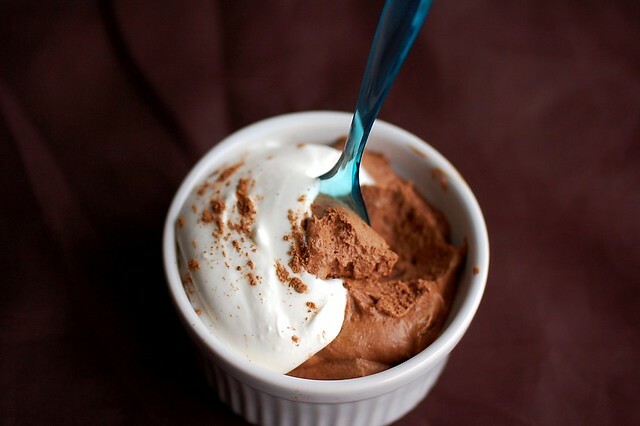 30 comments on "Mousse au Chocolat"
That looks delicious - so light and chocolatey. Plus, your bucket list is awesome. Definitely cross that baklava off, it is my favourite treat. Ohh there are too many things to mention on my list. I have so many variations of some recipes (brownies) that I never know which ones to bake next! I looove making chocolate mousse! In France, the most widely used recipe is the one on the back of the Nestle Dessert chocolate bars: 6 eggs (separated), 200g of chocolate. Melt the chocolate, mix in the yolks, beat the egg whites to stiff peak, combine, ta-dah! Oooooh, I'm definitely going to copy you on this recipe. I also like the bucket list. I want to try macarons next. A couple of flavors for variety. I love the idea of a bucket list of dishes to make. Chocolate mousses is also perfect to make for Valentines Day since it is easy and you can then spend more time out of the kitchen with your Valentine. I want to make Shoo Fly Pie so bad. I keep putting it off, but I don't know why; it sounds like heaven to me! I have my Baking Bucket List (called "My 100") and I love it! It really gives me some ideas on days I want to make something but not sure what appeals to me. There is always something new and exciting on the list! That chocolate mousse looks so decadent, I would love some of that right now! I'm fairly certain that I will now be dreaming about chocolate mousse for the remainder of the day - these photos are just that intoxicating! Oh, and I love your baked good bucket list - I can't wait to see some of those goodies on Sugar Plum! ohhhh I was planning on making chocolate mousse, so I think I'm going to try out your recipe!! Hehe I love the idea of a baking bucket list, I saw that on a blog as well (17 and Baking?) and I really want to make one. This looks divine! I crossed off one of my bucket list desserts this weekend-- chocolate souffle! Can't wait to see what you come up with next! macrons are totally on my bucket list too! the closest I've come to making chocolate mousse is to making a chocolate mousse cake...it was so easy and so mindblowing...even though I'm not even a real serious chocolate lover! What a perfect dessert for V-Day! 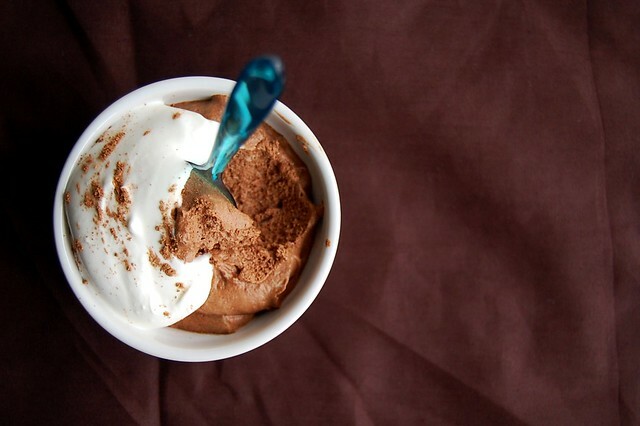 Chocolate mousse is such a satisfying thing to make - not that difficult but so impressive. Delicious and simple. I LOVE this. The bucket list is a great idea. You should make your bucket list an actual page like your about page so you can add a tab at the top. No fear of raw eggs here! I'm notorious for eating batters or doughs before they're baked. Just don't tell anyone=) As for your list, I've made macarons. Slightly pricey, and a tad time intensive at first, but totally worth it! I took horrible pictures of it, but they were amazing! I've also made the German pancake, but shoe fly pie is on my list of things to bake too! What an amazing bucket list! I haven't even heard of half of those things!! Looks so delicious!!! There are tons of things I want to make too! The list just grows. I saw you had shoofly pie on your list. THAT is my favorite pie ever!!! Even better than chocolate pie! I hope you try it. I've made it and it's so easy. Love you and love your blog...I've been reading it for a while now. I think this is awesome. I recently read the most amazing primer on macaroons at http://www.pastrypal.com/..definately work a look, the women is a pastry chef. Lucie, Mmmm I'll have to try that! Helena, sounds great! I'd really like to make that soon. Lorie, good idea! I will have to do that soon. I've made mousse with raw eggs and lived to tell about it. I just buy my eggs really fresh at the farmer's market. My bucket list includes puff pastry and cinnamon rolls made from brioche dough. Your moussse looks absolutely perfect Emily :) Perfectly fluffy and I'm sure perfectly delicious. Great bucket list! Macarons is on mine too. I would have to think more about it. Probably a croquembouche as well. This chocolate mousse looks awesome! Fun bucket list! 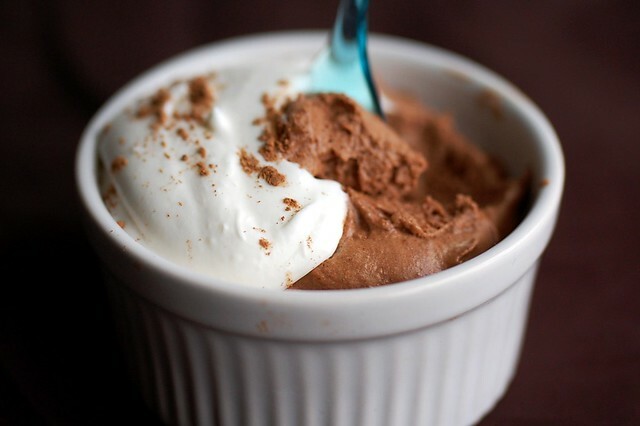 Chocolate mousse is such a classic and SO good! Yum yum yum! What a great looking dessert! Perfect end to any romantic day!